Whether you’re a pastor of a local church, the CEO of a Fortune 500 International Corporation or the second baseman for the local Little League Baseball champion, setting attainable, intentional and measurable goals is usually the difference between success and failure. Beginning the first week of January 2012, every congregation in the United Methodist Church will be asked to track their progress against goals they researched and established for themselves in the fall/winter of 2011. This process, to set and follow goals, comes as part of the denomination’s Vital Congregations initiative outlined in the Call to Action Report from the Council of Bishops. Give clarity and focus to ministry. Clarity and focus connects disciples to purpose and focuses their attention toward the purpose of the church. Move the church forward. Without goals, congregations can become stuck in a rut, doing the same things over and over without making progress. Create greater accountability. Goals that are prayerfully developed and discerned with God in mind keep us accountable to the ministry of Jesus Christ. Holy Spirit inspired goals that are achieved make us more like the body of Christ. Make the congregation better. There is a saying, you do not have to be sick to get better. Good goals make us better. Not for better sake but make us better for serving the community. The process to set these goals will be through the Vital Congregations website, which is simple to use and even easier to access. Later this week, each church pastor and lay leader will receive an e-mail from Gary Lindley, executive director, Center for Evangelism and Church Growth, with detailed instructions for setting 2012 goals on the Vital Congregations website. We’ll also post those instructions on the Vital Congregations page of the ctcumc.org website. Generous in stewardship and giving within and beyond the local church. 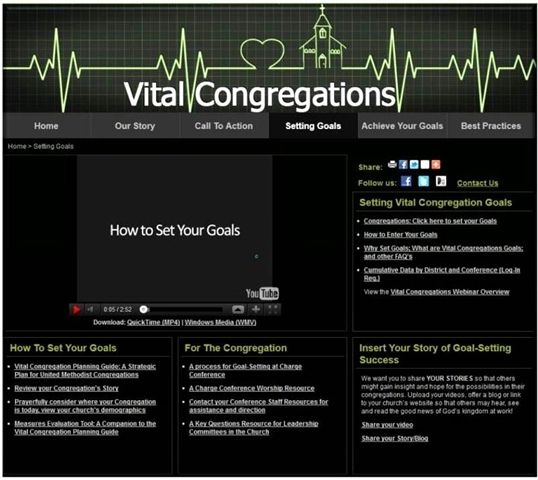 The Vital Congregations goals tool is ready for you. If you haven’t explored the site yet, we urge you to do so at your earliest convenience as there are several good and quick training/info videos and documents to help you through this process. After setting goals, churches are encouraged to do all in their power to achieve those goals and invited to celebrate their achievements. In January, each church will respond to a weekly e-mail from VitalSigns (the reporting & measurement arm of the Vital Congregations tool) in which they will track that week’s metrics and share their stories of God moving in their congregations. Together, God will bless the United Methodist Church, the Central Texas Conference and your congregation and increase our numbers because of our faithfulness to God’s call for our denomination.